Have you ever had an interest in a subject without having the ability to learn about it in school or at university? Often, our workload and busy lives allow for very little leeway in indulging in potential interests or hobbies. If you’re looking to expand your knowledge or interested in earning some credentials in a new subject, then you should look into free online courses. Certification and diplomas are available online and accessible as soon as today. Rather than busting open an old textbook, you can now access materials from university-level courses online. If you do not have the funds nor the time to dedicate to a traditional degree or college course, then your best option is free online courses. Certification and diplomas are available to any type of student, whether you already have a college degree or not. Online courses are a great option for many people because they allow anyone to access knowledge that has been curated for an online learner. Instead of digging through many books to find the specifics you need to know about a subject, online courses condense the information you want or need to know about a subject into a more digestible format. Some online courses offer graded or peer-reviewed assignments that will allow you to be assessed on the course. Once you’re being assessed, you get one step closer to earning a certification or degree online. In today’s world, recognition of online degrees is becoming more popular, so that you can make a career change at any time without going back to school. Working toward credentials online will provide you with a flexibility that would be impossible with a traditional course at a university. Another benefit to taking an online course is the ability to work on that course from anywhere, so if you’re a traveler, you can still work on your education as long as you have access to the internet. But who really benefits from online courses and how do you know if an online course is right for you? What Learners Would Benefit from an Online Course? Learners that have busy lives or less time to dedicate to their learning can benefit from taking an online course rather than a traditional course. Students that are working towards a degree at a university can easily take a course without sacrificing the time they need to dedicate to their studies. Because Coursera allows you to take courses that are accessible at any time, you can work at your own pace and complete work as you have free time. But are online courses the right option for your learning style. And what if you’re a kinesthetic learner? Should you still take an online course? The answer is that every type of learner will benefit from online courses. If you are a kinesthetic learner, you can get active while you look over notes or visuals and try to apply what you learn to the real world, which will help to contextualize what you have learned. If you are an auditory learner, you should find courses that offer videos or recorded lectures. Speak about what you are learning to others to share knowledge and solidify the information you are learning by putting it into words. For the visual learner, there are similar benefits to using online courses. It will be helpful to a visual learner to use and look at color, watch videos, and look at graphs, diagrams or any visuals provided by the online course to supplement the information you are learning. Most learners will find the quizzes, projects, and lectures to be conducive to their learning, but if you do not want that option, then you can focus on the information provided in the course rather than the self-assessments. And every learner will benefit from access to online forums, where you can discuss courses with other learners and apply what you learned. An online course will only be as good as you make it, so put in enough time to get the most out of the materials you are provided by the course. But where can you access a variety of courses from different universities? And what source will offer courses that cater to many different types of learners? It can be hard to find the right resource for online courses if you’re looking for a quality education. Luckily, Coursera has compiled all the best online course offerings for you to access for free. Coursera offers the best options for free online courses. Certification and diplomas will give you an edge when job-seeking and you can indulge in your interests without wasting time. If you are considering taking free online courses, then try out Coursera. Coursera is an online education provider. If you’re looking for a great resource for online course, Coursera is a good place to browse your options. It is the world’s largest online learning platform and provides access to materials from over 2400 courses. Coursera is free to join and offers many online courses, certificates, and degrees in a variety of subjects. One of the biggest benefits to using Coursera is that the courses are all taught by instructors from top global universities. Coursera offers courses that will appeal to many types of learners. Access to videos, graded assignments, and additional resources will allow you to get the most out of the courses you enroll in. 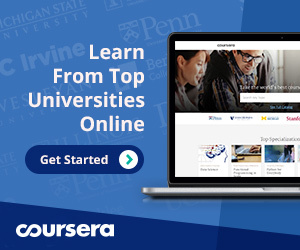 Coursera not only offers many different options from a plethora of universities, it also has access to courses and materials from world-renowned universities such as Stanford, Princeton, and the University of Pennsylvania. As you take a look at a course, you’ll find that Coursera has done the hard work for you. Each course has an overview, or description of what the course covers, as well as the time you’ll need to commit to, the language you’ll learn in, what you’ll need to pass to successfully complete the course, and the ratings from previous students. If you need to know more before taking the plunge, you can access the syllabus and check out what you’ll learn from week-to-week. Remember that Coursera allows you to work at your own pace, so even if you need to skip a week or two, you can still finish your course. Coursera also offers the ability to do assignments that are either auto-graded or peer-reviewed, so you can get the feedback you want on what you’re learning. Coursera also offers filters to use when you’re searching for a course. You can search by general areas of subjects and then get more specific in your search by narrowing what topic you’re looking into. You can search by skills, job title, type, and even what university you prefer. If you’re looking to learn a course in a language other than English, you have that option. If you’re looking for a particular subject, topic, or skill, you can search by that criteria as well. And on the main hub of the website, you can check out trending courses so you can stay on top of what’s popular. Coursera also makes sure to be upfront with you about the quality of each course by providing information and ratings from other learners just like you. If you want to know how other learners found the course, you can check out what they said in their review. If you are self-motivated, Coursera is the perfect place to take free online courses, certification and diplomas included. Even if you are not a go-getter, Coursera could be a great fit for you. If you find yourself slacking with your work, it would benefit you to schedule in time to work on your courses with Coursera. This way, you can get all of your work done with all of the benefits of taking an online course, and should you need it, you can simply rearrange your slotted Coursera to fit your schedule. Another great way to use Coursera is to audit a course by accessing the materials you want or need without getting graded. If you are simply looking to expand your knowledge, then you do not need the option of graded assignments. If you are looking for credit, then you can take on the assignments and get feedback on your work. Plus, if you earn credit with Coursera, then you can use that certification in the real-world, which will help in your next job search. The main benefit to using Coursera is that it is one of the most popular online education providers, so you can rest assured that the education you receive through Coursera is high quality. Coursera also offers more options to the learner than just online courses. Getting qualified through Coursera is easy, fun and comfortable. Through Coursera, you can take control of the way you learn, the environment you learn in, and how much time you spend every day or every week on a course. Since you can access Coursera anywhere and at any time of day, you can focus on family and work when you need to, without any hassles.